I've said it over and over again, the burbs do not get any love when it comes to good eats. Not don't get me wrong, there are some gems to be found and of course there are plenty of chain restaurants around, but in general, the most trendy destination restaurants reside in Vancouver (specifically Downtown). 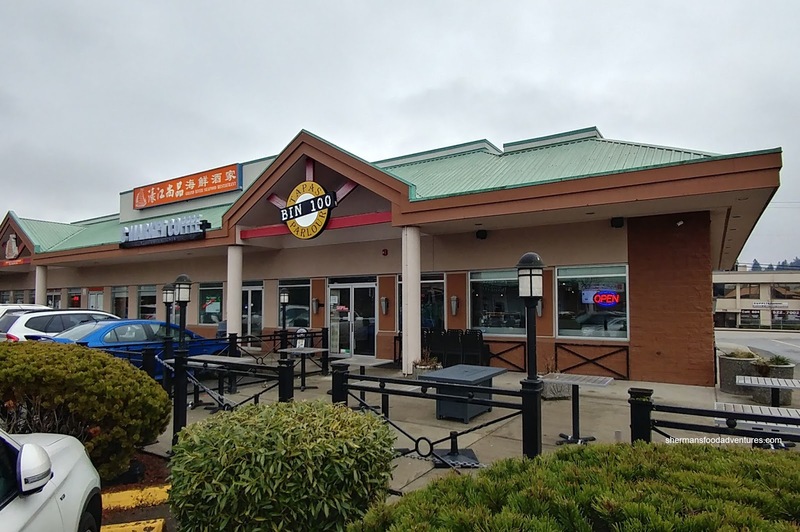 However, things are slowly changing as we see many of the same clientele who once called Vancouver their home moving out to the burbs. Count me as one of them since I used to live in Yaletown and now I'm nowhere near the action as I once was. 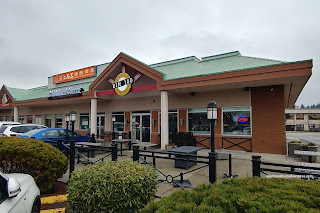 So when I found out that Bin 941 opened up a location in Coquitlam called Bin 100, I had to check it out. We actually came for lunch prior to watching Star Wars: The Last Jedi with the kiddies. 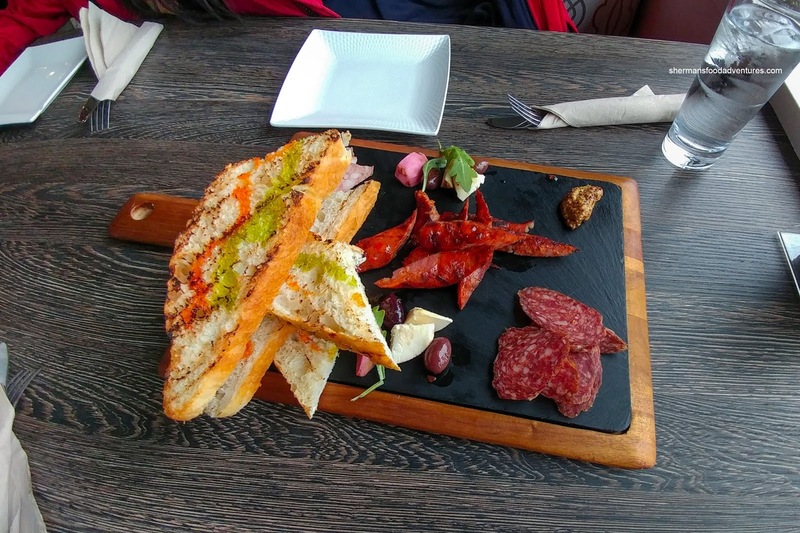 We began with the Chacuterie sporting grilled pork chorizo, duck terrine with grand marnier, Argentinian salami, marinated bocconcini, olives, mustard, pickles and grilled focaccia. This was pretty straightforward, yet tasty nonetheless. The bread was fantastic being soft with a nice drizzle of chorizo and basil oil. The duck terrine was meaty and aromatic while the fatty chorizo was slightly spicy and smoky. 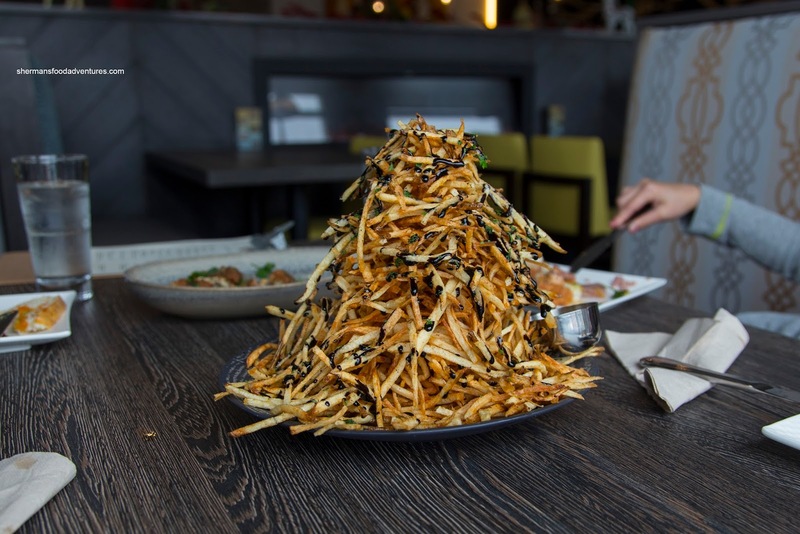 Next up was their signature mountain of shoe-string Pomme Frites drizzled with balsamic glaze and served with a side of truffle tyme aioli. Akin to Hickory Sticks but of course way better, these were crispy, well-seasoned and the beneficiary of the sweet sticky and slightly tart balsamic. 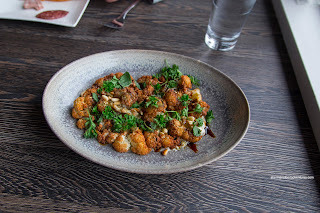 Onto our veggie dish of the meal (although the pomme frites could've been considered that too...), we had the golden fried Cauliflower with zatar, pomegranate molasses and pine nuts. Naturally with the zatar, the dish had a Middle-Eastern flavour to it where there was a touch of spice to go with an equal amount of acidity and sweetness. Loved how the cauliflower was fully-cooked without losing its crunch and bite. 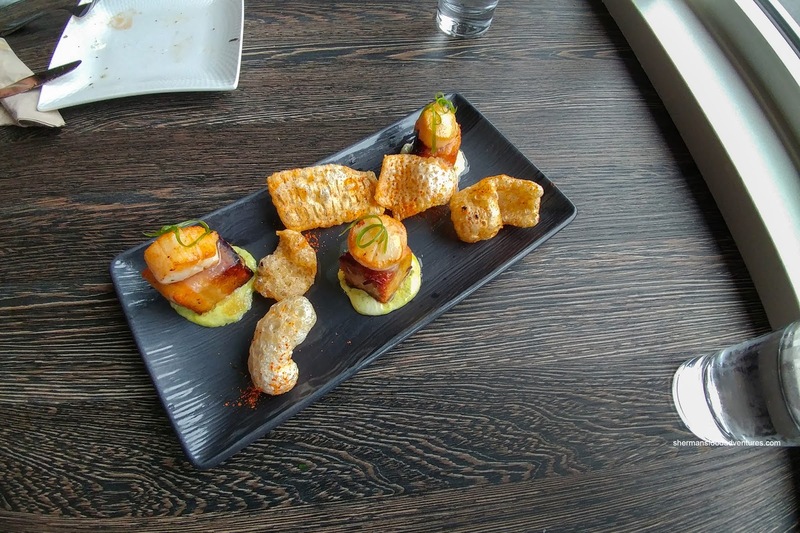 Neatly plated with spiced chicharones, we had the Scallops and Pork Belly with apple glaze atop scallion sour cream. Both proteins were on point where the scallops were buttery with a nice sear while the fatty pork belly was soft and required very little effort to break down. With the apple glaze, there was definitely some sweetness to go with the tang from the sour cream. 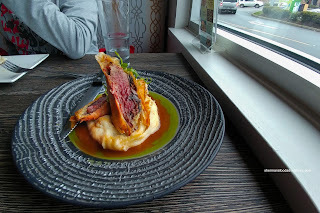 One of my favourites was the Beef Wellington featuring AAA tenderloin in a mushroom and red pepper crust wrapped in phyllo. 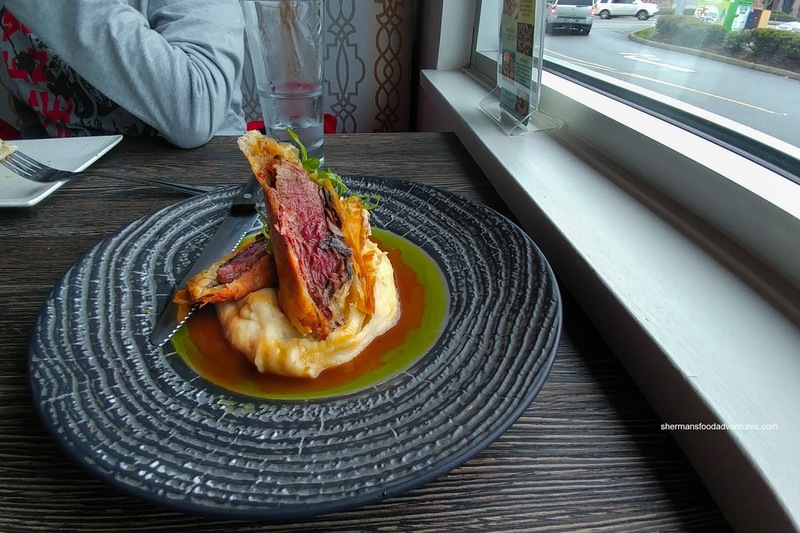 Underneath, there was a confit garlic mash surrounded by a marsala jus. Tender and well-seasoned, the tenderloin was a beautiful medium-rare. On the outside, the phyllo was crispy and stayed so despite the moisture. Not merely a side, the mash was smooth and garlicky. Bringing it all together was the jus that was meaty and full-of-depth. 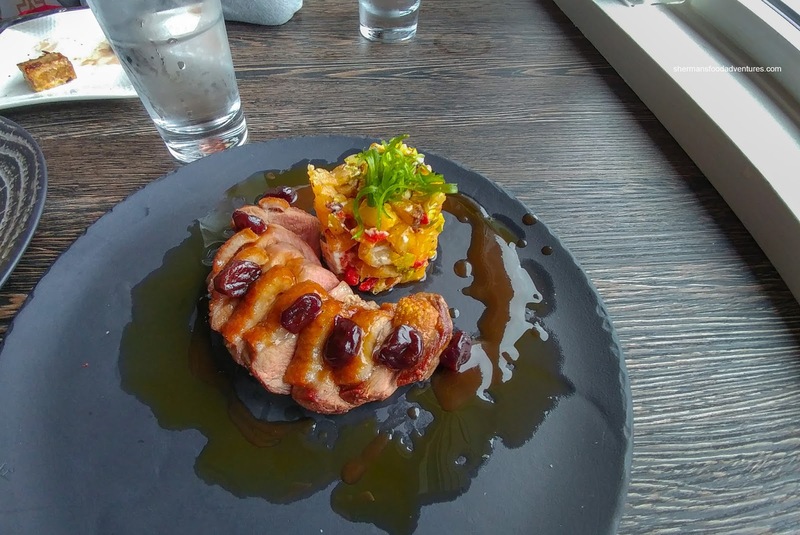 Our last dish was the Honey Glazed Duck with potato goat cheese hash and marsala cherry jus. This was our least favourite as the duck was a bit dry and overdone. Furthermore, the skin was not crispy nor rendered enough. The jus was fantastic though having a rich sweetness and a background tang. As you can see, the food at Bin 100 was not far from the original Bin 941. This is fantastic news to people who want some legit tapas, but didn't want to travel into Downtown.